I love me some Light Gun Games, and today is the 2 year anniversary of our most consistently popular article “Light Gun Games, why you need an old TV” as well as the first Time Crisis and it’s sequel Time Crisis: Project Titan. So what better way to celebrate such a milestone than to play Time Crisis II, the arcade smash of 1998 in its home console conversion glory! Being an on-rails light gun game, you can figure this one out. 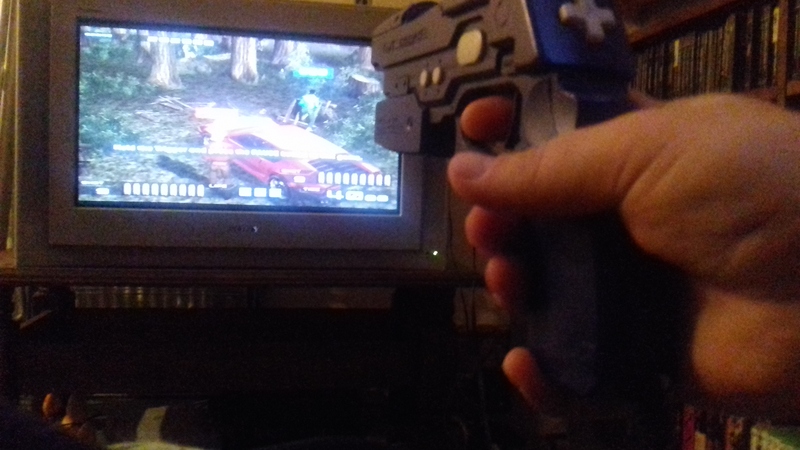 You point your uber manly plastic weapon at a CRT and make shooty noises. The differences with the Time Crisis series is that you can duck off screen. The primary purpose of this is to reload, but if you have the reflexes, it is also a “overpowered button of dodging the incoming bullets and non-death“. It can be very satisfying when you see the bullets heading towards you, and being able to Matrix your way out of the way. The other key difference to Time Crisis II is that it supports linked play. 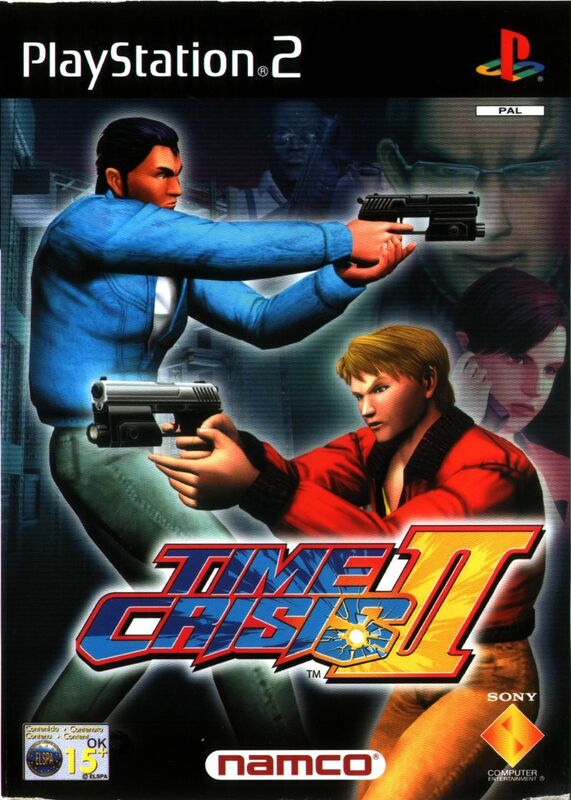 If you happen to have a friend, who; has a CRT, a PS2, a light gun, and a copy of Time Crisis II you can relive the full arcade experience with two simultaneous players working together, on slightly branching paths. There is local 2 player for the rest of us plebs that uses split screen, but those that have a very specific friend can have a lot more fun. I mean why WOULDN’T you fight a black dude wielding a missile for a melee weapon?! Like in Time Crisis it is easy to tell which enemies to prioritise. Dudes in red are the first target, then elite looking chaps. Or dudes with grenades/Rocket launchers. The standard blue guys can in theory shoot you, but you gotta be pretty hopeless to get hit by the fodder even on harder difficulties. Gone is the combo system of Project Titan, but in its place is a nifty hit hit counter. If you shoot the same enemy multiple times, and shoot somebody else quickly you can rack up bonuses to your score. This isn’t required for standard play, but does offer a nice distraction to score hunters. This mode also comes into its own when you unlock the submachine gun in one player two gun mode. ONE PLAYER TWO GUN MODE! 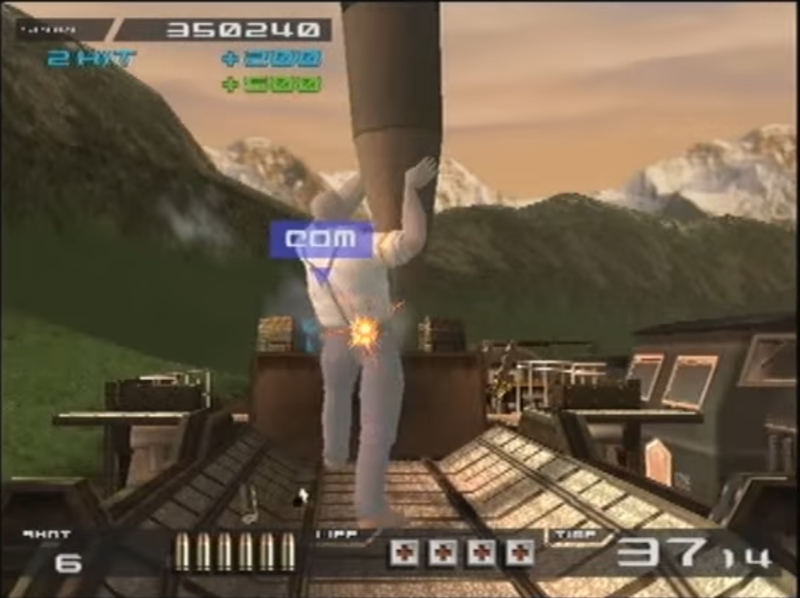 Time Crisis II for the PS2 has a new mode lacking in arcades, and it is 2 guns one player. It is specifically designed for nerds like me to play on my lonesome, I mentioned how much fun it is to play a 2 player gun game on your own in Virtua Cop 1 and Virtua Cop 2. I tried in Crypt Killers, but that was too hard and both the Lethal Enforcer games are too broken to try it. To finally be given an “official” 1 player two gun mode was heaven for me. The problem though, and it is a fairly big one. It murders your wrist trying it. Using the GCon2 you need to press the reload button underneath the guns handle. With one gun this is easy, as you can holster the gun, or use other hand. Now. it is next to impossible to take a picture of yourself holding two light guns, so here is how you hold one gun in two gun mode. My pinky finger is completely wrapped underneath the gun. Repeating this on another gun, and for the 15-20 minutes it takes to do a run means you will be in some considerable pain after attempting it. The problem is caused by the fact you need to press reload on both guns to duck out and reload. If one gun was the master, and the other the slave it’d be fine. As it is, twenty minutes of the “claw” hand positioning is a little paralysing. That isn’t to say 2 gun mode isn’t great, as it is a barrel of laughs, and totally worth playing. But it is a play once, come back in a few hours otherwise RSI will kick in type mode. Again, this is an on-rails light gun game, so you have 3 stages split into 3 levels. 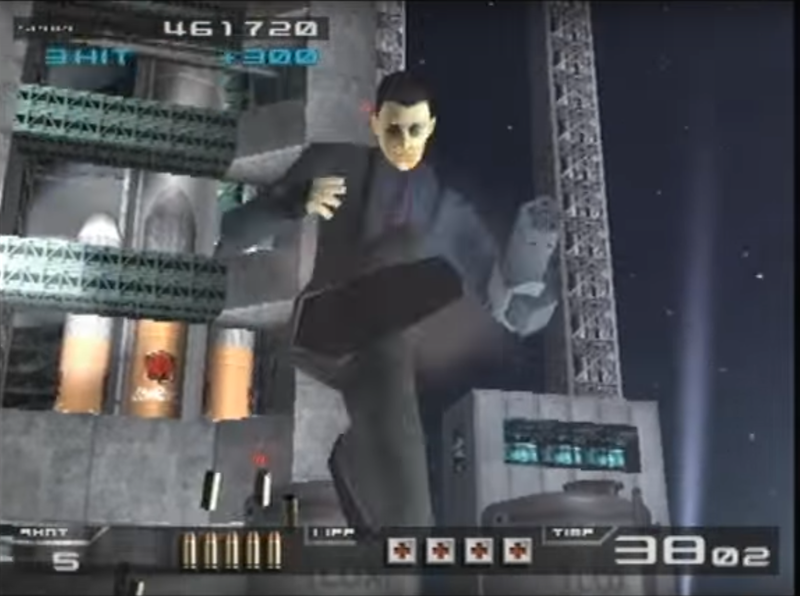 You fight a boss on the final level of each stage, and each stage is very loosely connected by cutscenes. Some of these cutscenes are unique to the PS2, and missing from the arcade version. You play as either Keith Martin or Robert Baxter, V.S.S.E (Vital Situation, Swift Elimination International Intelligence Agency) agents tasked with recovering data on a weaponised satalite made by NeoDyne Industries, that your colleague Christie Ryan has managed to smuggle out. Your plans are thwarted when the evil people realise this, and kidnap Christie. You then RE-recover this information, and then set out to stop the evil people, and culminates with you destroying the satellite. Mad Dog is such a badass, he brings kung-fu to a gun fight! As Light Gun games go, Time Crisis II is almost a perfect example, a game like Resident Evil: Dead Aim is slightly superior because there is a fleshed-out story and game behind the mechanics, but for pure On-Rails experience, you are not going to do much better than Time Crisis II. This is on a par with Point Blank 1 and Point Blank 3. Finally, if you stick with it and get all the unlocks, two gun mode with machine guns is the most fun you can have with a light gun game. 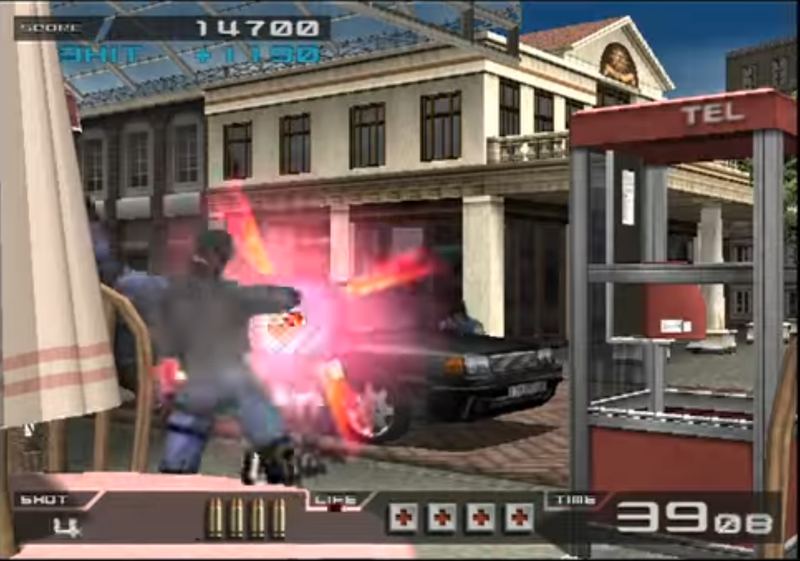 The Arcade smash that is Time Crisis II was released to mostly positive reviews (81% Metacritic) in 2001, with particular praise for it’s split screen play, as well as backwards compatibility with the PlayStations GCon45 Light Gun. Loved this game. Think I still have my copy of the original with a GCon. Didn’t know there was a 2 gun mode in the follow up! 2 gun mode is THE BEST!? I remember doing Confidential Mission 2 gun style at the arcade once. Much harder than I expected!